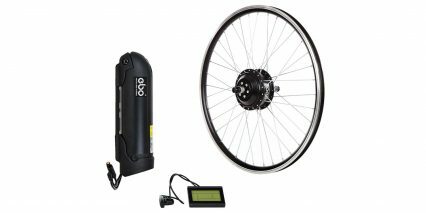 Electric Bike Outfitters sells a range of ebike kits and is a leader in terms of customization and customer support. 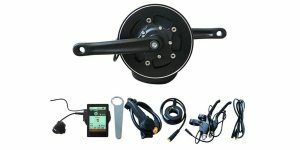 Most of their kits utilize hub motors which can be mounted either in the front or rear wheel. They offer a range of wheel sizes, silver or black color choice, and different battery capacities. The mid-drive kit is quite different because the only real choice on offer is battery mounting position. You can use a downtube mounted Dolphin style pack or a rear-rack design with integrated LED light. It should work with most wheel sizes but only fits specific bottom bracket widths, 68 mm to 73 mm. I cannot say for sure, but I would guess that it’s only compatible with chain driven bicycles, not belt drives. I say mostly sure, because you can swap the stock 42 tooth chainring with larger sizes to slow the cadence and maximize top speed. What I experienced during this review was a relatively quiet, lightweight ~6 lb, efficient mid-motor. 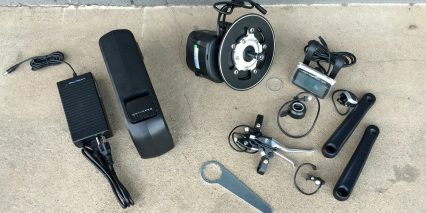 The benefits of a setup like this are reduced unsprung weight (in the case of a bicycle with suspension), easier access to the wheels for maintenance (because you don’t have an extra cable running to one hub and nuts securing a fixed axle), and the ability to empower the motor by shifting gears as you ride. 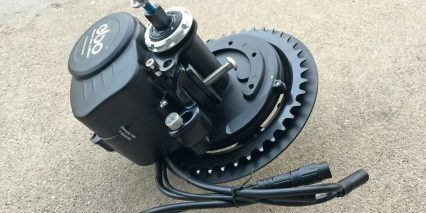 The drawbacks include increased drivetrain wear (on the chain, sprockets, and derailleur), more difficult installation, and the requirement of gear shifting in order to maximize speed or power. For example, if you start from standstill in a high gear, the motor will struggle and climbing will be difficult. I love how compact this thing is, but couldn’t help but feel a little concern about how exposed it might be to rock and log strikes, protruding from the bottom bracket as it does. I appreciate the flexibility of battery mount style and love the display panel, even though it’s unique from every other EBO kit. I was a little underwhelmed by the power and torque on offer from the Mountaineer at first, because the stats say 350 to 700 watts and up to 80 Newton meters of torque. 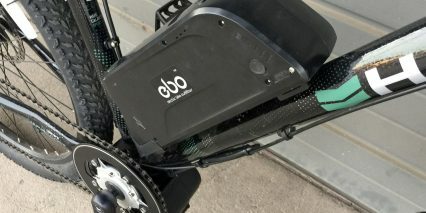 That’s significantly higher than most of the mainstream electric bike mid-drives that I have reviewed for Bosch, Brose, Yamaha, Shimano, and Bafang. 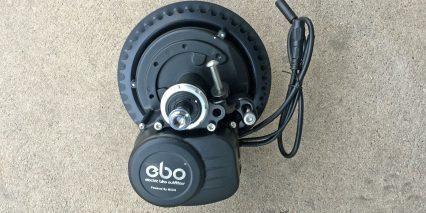 It performed a lot like the lightweight Shimano E6000 mid-motor, which is commonly found on neighborhood and city bikes. Without the anchoring point of high advertised values, I would have approached and received this kit much differently. 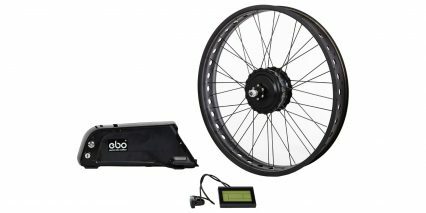 In practice, it’s an efficient aftermarket mid-drive that performs best when you’re pedaling along actively and has the unique benefit of throttle operation! 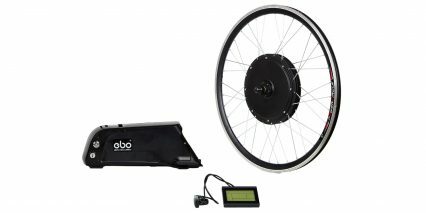 It uses a torque sensor vs. a more simple on/off type cadence sensor found on some of the older and less sophisticated Bafang BBS01 and BBS02 kits, and that makes it feel smooth and responsive. But for me, it didn’t feel as dynamic or capable as Bosch or Brose, even in the highest level of assist, you cannot really tap into the torque… and it feels pretty weak when starting in a higher gear, as mentioned earlier. One of the other stats that threw me off here was the high RPM cadence matching that Jason (the founder of Electric Bike Outfitters) told me about. It seems like every mid-motor has a pedal speed where it just sort of fades out. 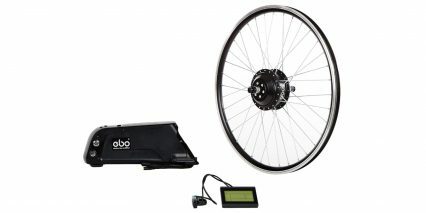 The faster you pedal, the less support you might receive from the motor, usually around 100 or 120 RPM. What this means is, you’ll have to switch to a higher gear and pedal slower if you want the motor to contribute effectively. I was initially told that the MXUSE manufactured EBO Mountaineer could hit 4,000 RPM, but Jason was talking about internal drive speed, not pedal strokes… After I published the video, he clarified that the drive unit is rated at 103 RPM, which fits my experience much better and keeps it in line with the Shimano E6000 mid-drive mentioned earlier. 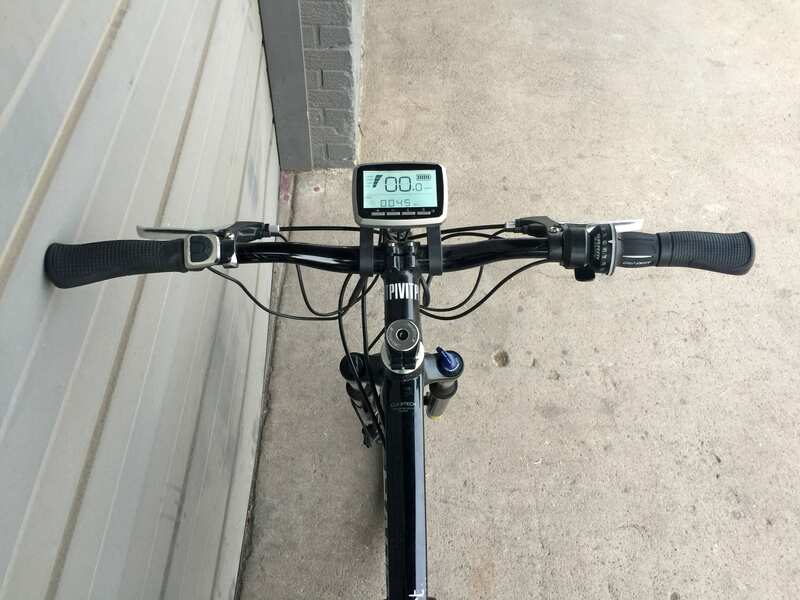 Interestingly, even when I pedaled way over 100 RPM, I could still hear the motor whining and activating, I didn’t feel it slowing me down at all, but I just didn’t feel support at those higher levels. 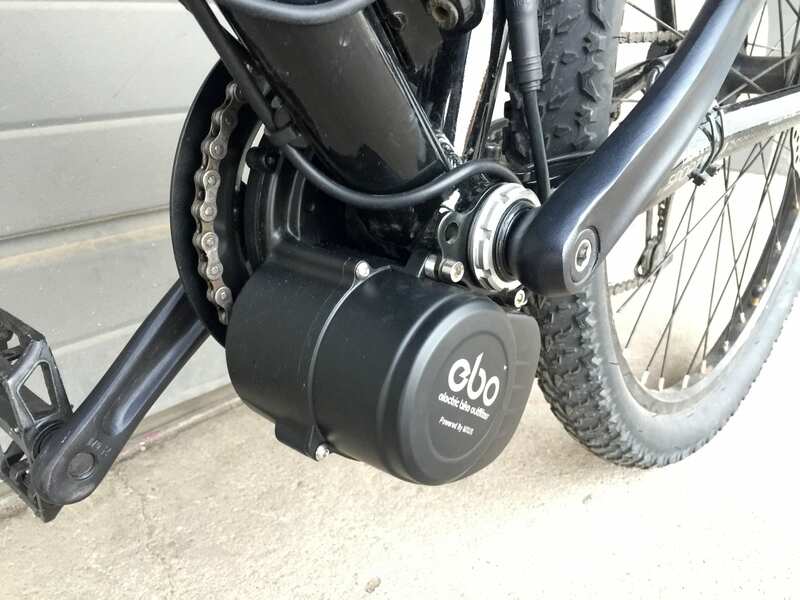 So coming back to use cases here… I’d say this motor would be a great fit for active mountain bikers who want to limit weight and convert an existing bike to be electric, or it would be a great fit for neighborhood riders who prefer a mid-motor to a hub motor. Perhaps you have really beautiful rims or want to preserve quick release? Perhaps you want a mid-motor with a throttle? These are all great uses for this kit. 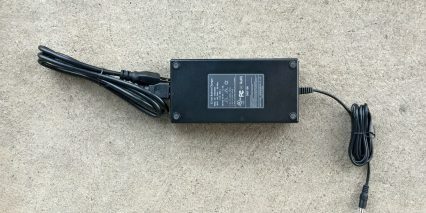 Powering the kit is a 48 volt 11 amp hour battery pack, offering above-average capacity and two mounting configurations. The downtube design is optimal for keeping weight low and centered while reducing frame flex, but it requires a sturdy pair of bottle cage bosses and an open space on your frame that is larger than a standard bottle cage. 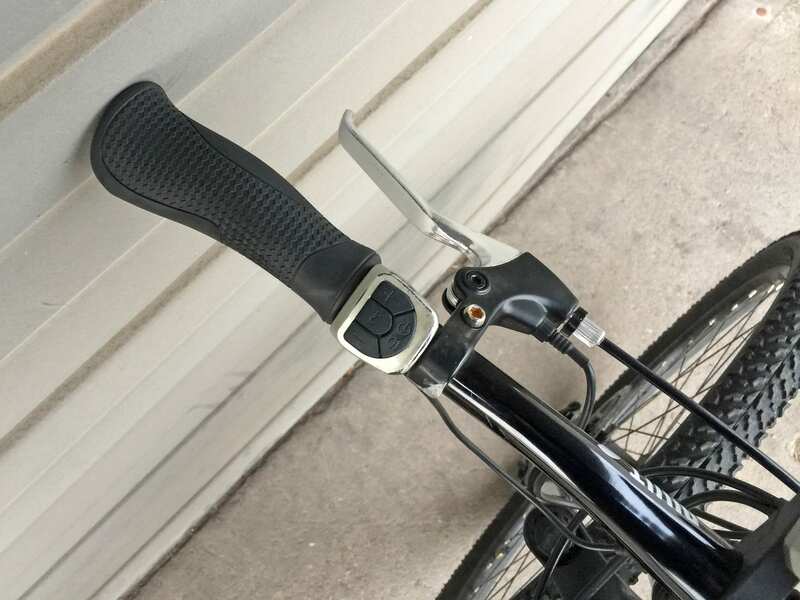 If you have a step-thru frame, this sort of mounting configuration could expose the battery box to kicks each time you mount and dismount the bike. The ideal configuration would be a diamond high-step frame as shown in the video review. 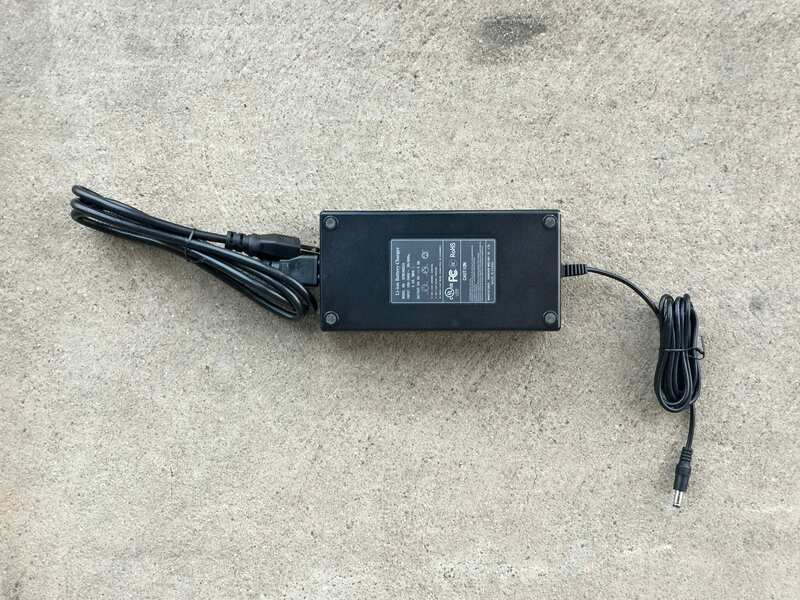 For those with rear rack bosses and space at the rear (meaning that you don’t have oversized fenders or a saddle that is set all the way down and sticking back) the rack battery is a great option. I regularly complain about weight being positioned high up and way towards the back on purpose-built ebikes that use rack mounted batteries, but it’s actually a decent option for doing conversions, because racks attach at four points vs. just two with a mid-battery. 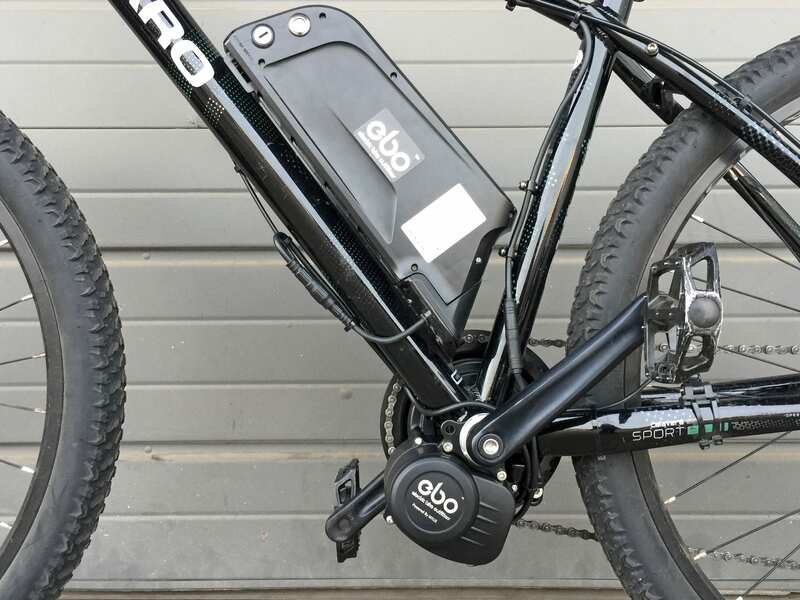 The rack battery option frees up your downtube for actual water bottles and gives you the benefit of carrying a trunk bag or panniers in addition to the battery pack! 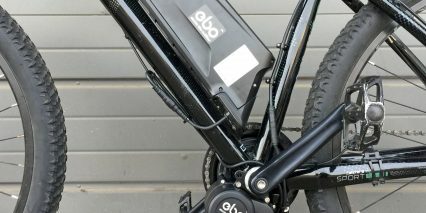 It’s even possible to use this battery design on a hardtail mountain bike, but not advisable. The bolt-on rack looks nice, and comes in two colors (silver or black), but has more potential for shaking around. 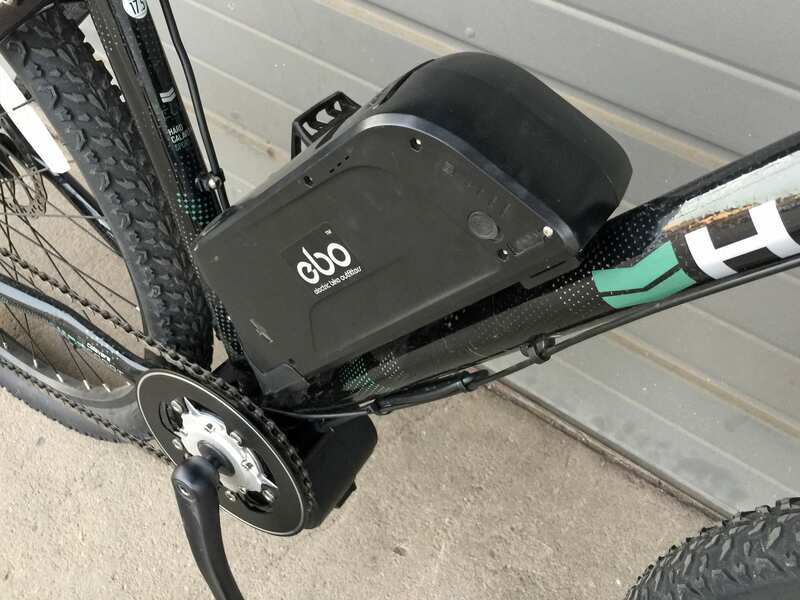 Regardless of the battery mount you choose, there’s going to be 7+ lbs of weight added to the frame, bolted on using braze-ons (probably) that weren’t designed to hold extreme loads. For this reason, I’d recommend using Loctite Blue super glue and being careful and attentive when riding off-road. 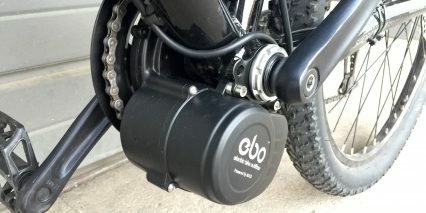 Also worth calling out here is the USB charging port built-in to the side of the downtube battery. EBO told me that they de-activated this port purposefully to reduce power draw. It can still be accessed for firmware updates, but the optimal USB charging location is under the display panel… and this location is more accessible too. 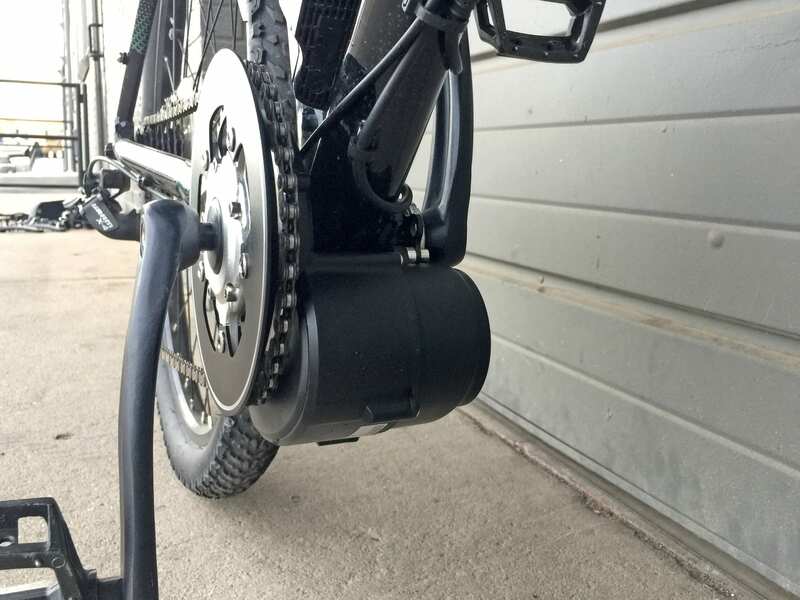 Whether you charge the battery pack on or off the bike, I suggest storing it in a cool, dry location. Avoid extreme temperatures, try not to drop the pack, and avoid letting the charge drop under 20% because that stresses the Lithium-ion chemistry. Jason recommends recharging every two or three months if you haven’t used the kit, just to avoid hitting those lower fills. Operating this bike is a two-step process. Both battery packs have hardwired on/off switches built-in (good for keeping them stable during periods of disuse and travel). 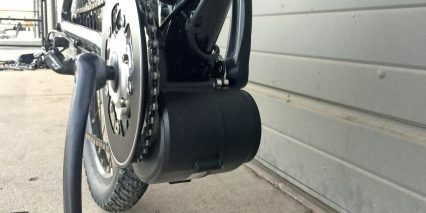 The downtube pack has a silver circle that you press, and it lights up with blue LED’s, and the rear rack battery has a toggle on/off switch below the light. 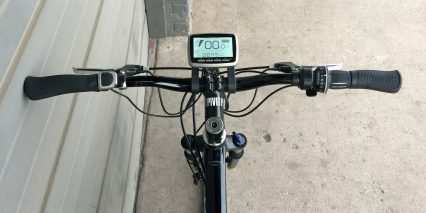 So, once you’ve charged the battery, clicked the on/off switch, and are ready to ride, you simply press the power button on the display panel itself. This display is large, clear, and highly adjustable. One of my favorite parts about most kits, and certainly the EBO kits, is that they allow you to lower the top speed. 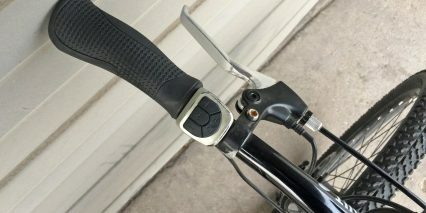 This could be useful if you are trying to qualify as Class 1 (pedal assist only, up to 20 mph). The default configuration of the kit is Class 2 (pedal assist and throttle, up to 20 mph), but I think you can actually raise the max speed in the display and go one or two miles per hour beyond 20. There are four levels of assist, Eco, Tour, Speed, and Turbo and I conducted most of the ride testing in Turbo mode to see how zippy the motor would feel, and how much noise it would make. It struggled to climb when I was in higher gears, but did pretty well when I shifted down to the lowest gear. 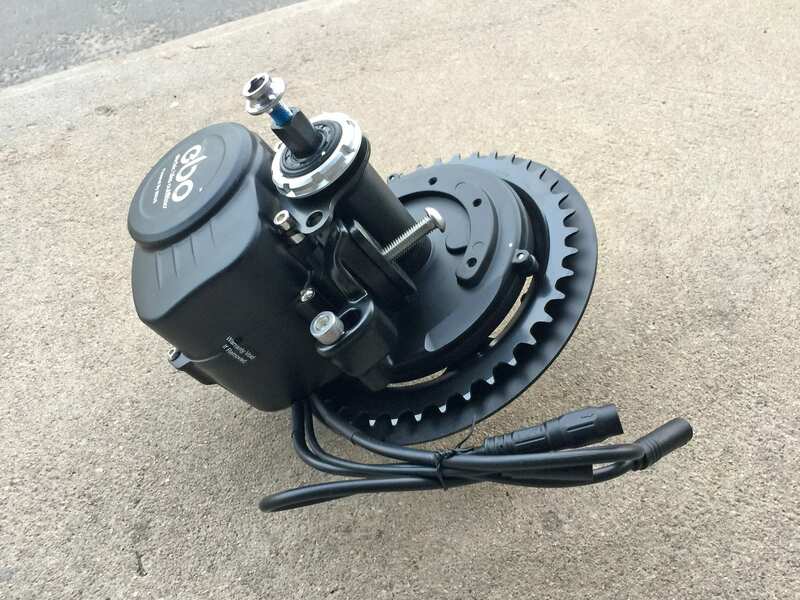 If you’re mounting this kit on a single speed bike, keep in mind that it might start a little slow and struggle with climbing because the torque just isn’t there. Again, looking at this thing side by side with a Bosch, Brose, Yamaha etc. it is physically smaller, but rated at a higher peak torque. My experience was that it’s just not that powerful… but that’s still okay for many situations. Two things I really loved about the display panel were the ability to turn backlighting on and off, and get battery level feedback with six bars vs. just four or five. This makes it more precise and could be the difference between recharging at a half-way point or thinking you have enough juice to get home. Two things I wasn’t so keen on are the fixed nature of the display (you cannot remove it when parking, so it could take more wether exposure or scratches at the rack), and that the battery charger is a bit large and heavy for being a more basic 2 Amp design. 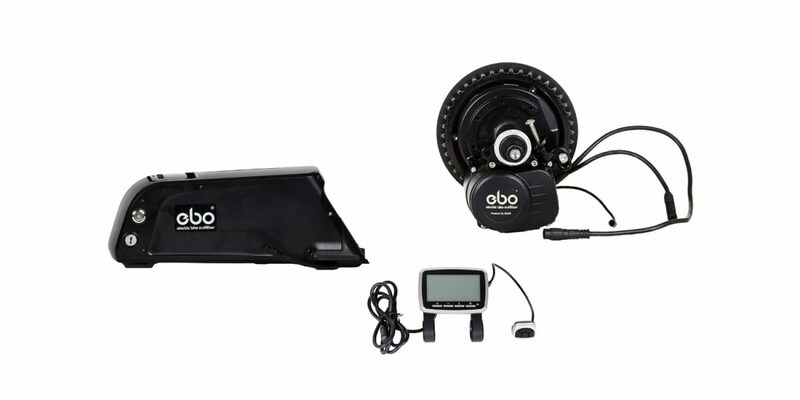 I hope I’m not coming off too strong with this review of the EBO Mountaineer Mid-Drive Kit. 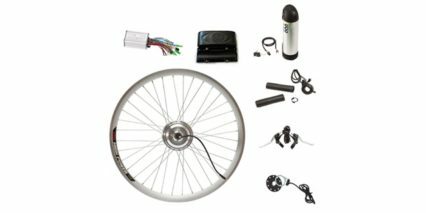 It’s one of only a few options for a DIY electric bike system utilizing a mid-motor and offering a throttle. I just want to set expectations accurately. I’m a fit, relatively lightweight ~135 lb rider, and I found it to be fun, but not super zippy. 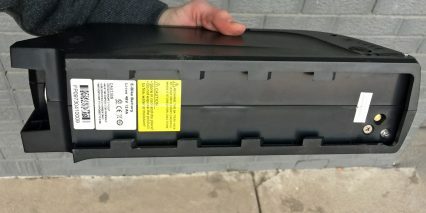 By resetting expectations here and emphasizing the flexibility of how the kit performs, emphasizing the great customer service on offer from Jason and his team, and exploring the benefits and trade-offs of each battery, I hope this helps you to make an informed decision. 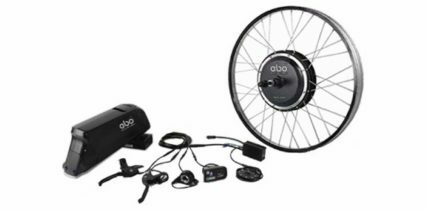 My favorite kit in the EBO lineup is the 48 Volt Burley hub motor because it balances lightweight nimble handling with zippy power and also has the throttle option. It might not get the same range as this mid-drive kit, if you have a range of gears and shift thoughtfully. Even though you could mash gears with this mid-motor, I don’t think it would stress the drivetrain that much, given the relatively low torque-power output. Big thanks to Jason and his team for partnering with me on this review, It was neat to compare his offering side by side at the company headquarters in Denver, Colorado. 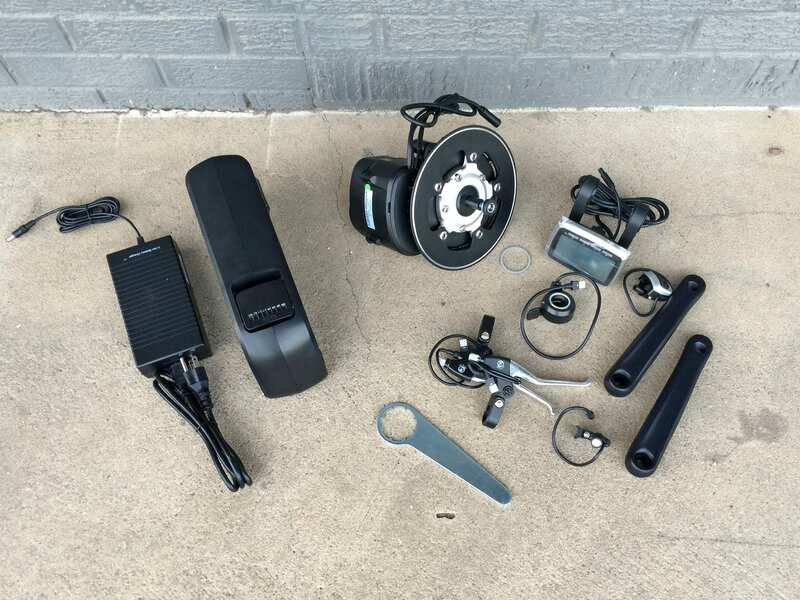 I’ll do my best to answer questions in the comments below and welcome you to connect directly with EBO and other owners or enthusiasts in the Electric Bike Outfitters Forums. This motor is a rebranded Tongsheng TSDZ-2, there’s a thread running on Endless-Sphere about this motor which is rebranded by several retailers in different countries. In it’s Austrian guise of the Schachner MM15 this motor was selected by Dutch bike builders to create “V8” models of the Workcycles FR8 mid-tail and KR8 box bikes. Fantastic feedback Dewey! Thanks for the link and detailed information about the motor. Have you had an opportunity to try it? What do other people think about it? As a 350W TSDZ2 unit with an 11.5 ah 48v battery, this is a very overpriced unit. Can be individually sourced elsewhere for under 700 dollars. The motor is well under 300 dollars many plqces. I live on a hill that gets up towards 15% in spots and I have it installed the same motor from another brand on my Yuba Boda Boda, and when the battery is fully charged (up at 56v), it actually does a pretty good job – but as the voltage drops, you really notice the speed dropping. 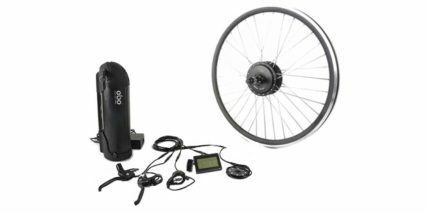 I find that on a 60lb bike, I’m riding up at about the same speed or a little faster than my partner who is on a Packster that probably comes in at 150lbs of bike+cargo – which definitely agrees with your assessment that it’s not as powerful as the Bosch CX. 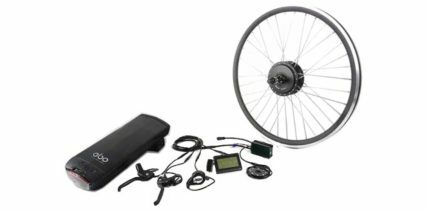 Today, the torque sensing stopped working for a few minutes – ultimately, since it’s not the most reliable, I plan eventually to install it on an old mountain bike to be a back-up commuter, using a battery shared with another bike. Tip for ya’: Its never a good idea to start in high gear on any bike, let alone one with a mid drive motor. You are asking the motor to do way too much, and if you understand torque versus diameter of the sprocket, and gear you are in, then you’d understand the result you are getting. Some Bafangs for instance can deliver 160 Nm of Torque, but that doesn’t mean you want to abuse that, and start out in a high gear, and being able to get going easier, doesn’t mean that is what you should ever do. If you want to stretch the chain, and reek havoc on the entire drive train, by all means feel free to do as you please. 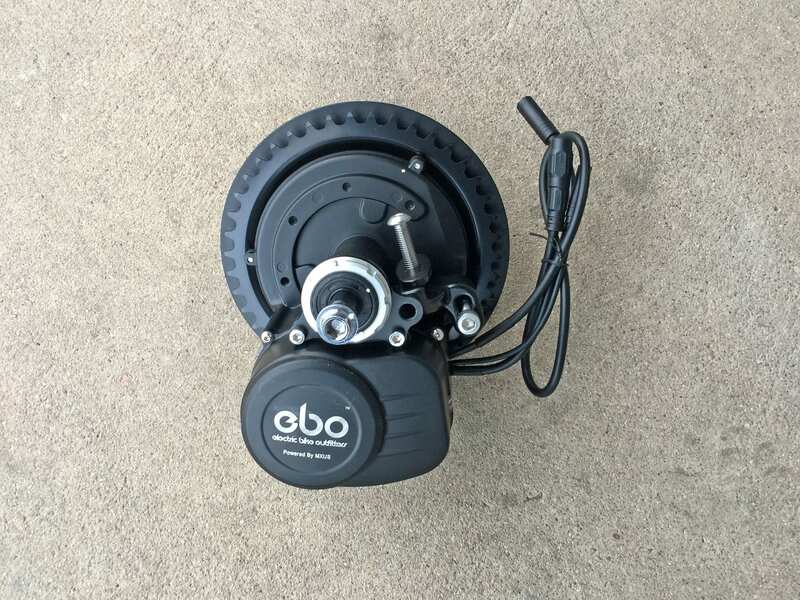 For all ebike riders, and would be purchasers, please use some common sense and realize these motors can add way more power than your own two legs typically can, BUT, also know that your performance of the motor drive and drive train (gears, derailleurs, etc.) is only going to last as long as what you practice in terms of the application. Meaning, please use your gears on the bike, to downshift to lower levels (i.e. 1st gear or 2nd) when hill climbing, and then similarly when on flats or going downhill, put the bike’s gears into the higher speeds (whether you have a 7 speed or 11 speed cassette). 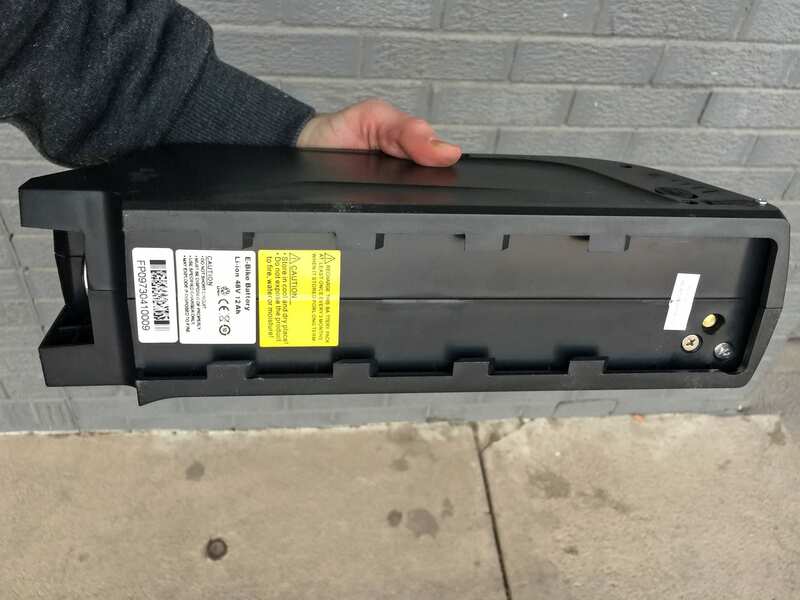 Otherwise you are going to make the motor do way more work, drain the battery faster than needed, and reduce the overall longevity of the drive train. I get a lot of people in my shop who think they are going to just stay in one gear, and move the levels of assist up and down. Well sure you can do that, but don’t expect the motor or drive train to perform as long as it should, and expect to have more maintenance. 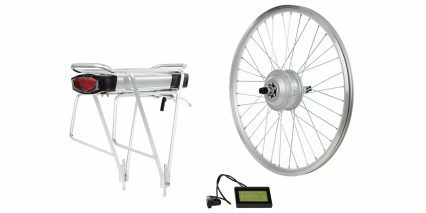 I would say use common sense, but that is a lot to ask of people who aren’t mechanically inclined, or really understand how gear ratio’s work, and what the impact of torque and speed are when using the typical set up on a bike. Great feedback Mike, I try to demonstrate different types of riding and encourage shifting (carefully). Your points are valid and it sounds like you’ve seen a lot of different ride styles at your shop. Where are you located, what’s the shop called?